As natural resources dwindle and rising temperatures threaten to alter entire ecosystems in unknowable ways, architects and designers are creating innovative ways to shore up humanity's resilience. 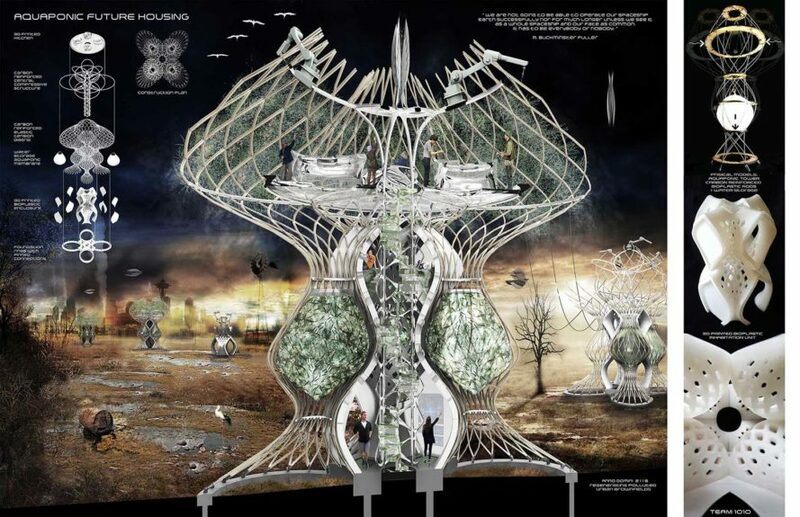 Aquaponic Future Housing, a conceptual design by Mihai Chiriac from DS 10 Studio at The University of Westminster, envisions homes that print themselves using simple materials, and then grow their own food, or at least some of it, so that the homes and families residing in them are almost completely self-sufficient. 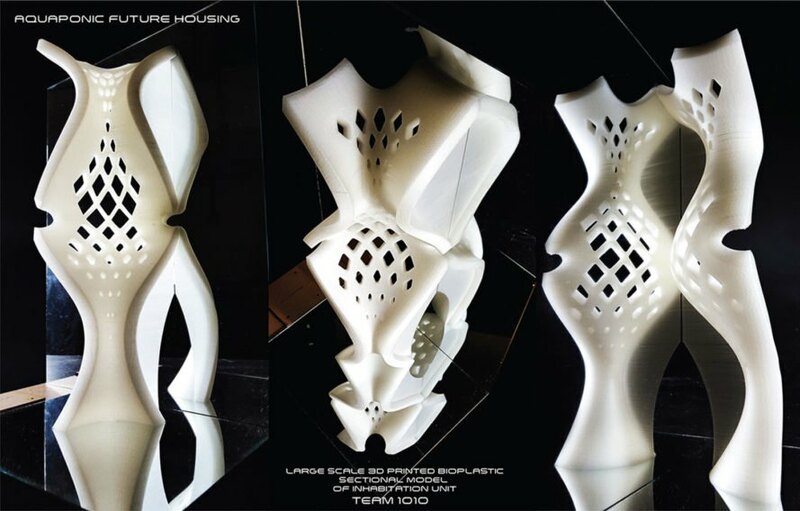 One of the finalists of Inhabitat’s recent Biodesign competition, Aquaponic Future Housing comprises a three-level home 3D-printed with biodegradable plastic that also has its own closed-loop aquaponics system. “A symbiosis between hydroponics and aquaculture,” aquaponics is a perfect example of a self-sufficient, living machine that produces food without creating waste or pollution. Simply put, an aquaponics system combines aquaculture (the raising of edible fish) and hydroponics (the growing of plants without soil) and consists of a hydroponic grow bed filled with plants positioned above a water tank containing fish or other aquatic life. Fish excrement and uneaten feed is filtered out of the water through the plants’ roots and is absorbed as essential ammonia-rich nutrients that allows plants to thrive. This win-win situation creates a highly productive ecosystem and yields more food per square foot than any other form of agriculture. Read more about aquaponics here. One benefit of this unique housing program, according to the designers, is its ability to regenerate urban brownfield sites that have been marred by various pollutants and make more land available to house a rapidly growing population. The homes 3d-print themselves using standard materials in the home. 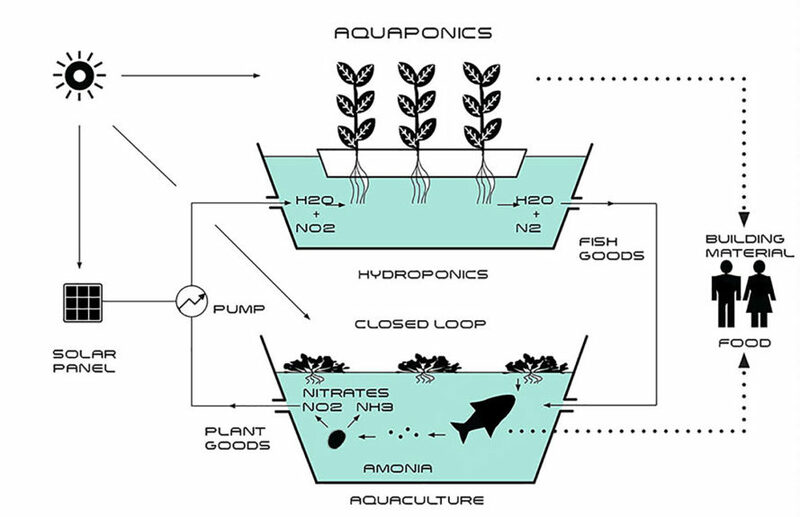 A closed-loop aquaponics system produces fish and crops. The homes can be constructed on former brownfield sites.